Join us for a “house party,” at our third stop, Austin Town Hall, as we look at the history of the neighborhood, highlight the famed “pink and white” house that preserves the story of an Austin family, and celebrate with free food, music, and family-friendly activities. The Austin Town Hall stop on the exhibition tour highlights the Victorian home of Yolanda Anderson, built in 1894 and purchased by Yolanda’s family in the 1980s. 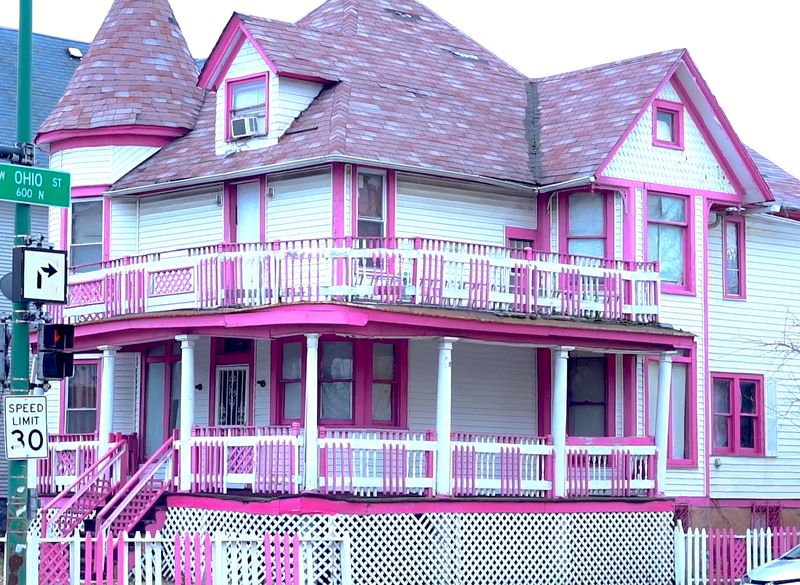 Shortly after purchasing the home, Yolanda’s parents painted the exterior pink and white, reminiscent of colorful homes of the south. This color scheme extends into the interior of the home, which is furnished with French colonial furniture. The home has survived two fires, the first in 1992 and most recently in 2005, and is famous within the Austin community for its vibrant colors. Majestic in design, the Austin Town Hall Cultural Center, site of the exhibition, was once the town hall of the Village of Cicero, Illinois. Today, the space is used for park activities including a variety of dance, music and theater classes, music production and more.